Pepsi Phone P1s expected price in India is ₹7,299. 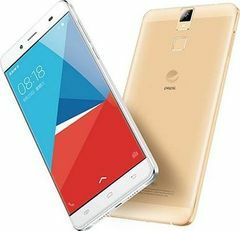 Pepsi P1s, which has been in news for some time now, is finally official in china for a budget price of $110 Approx. The hardware seems like blast from late 2014, but is still a sweet deal for $110. Afterall, a fingerprint sensor has also been thrown in the mix. The idea is, instead of buying a low-cost phone from a relatively unfamiliar brand, people would prefer a popular brand captioned on their handset. The Pepsi logo on the Pepsi P1s is tastefully implemented (Just imagine if Pepsi would have stuck to the blue and red design) and thus the whole thing kind of makes sense. The handset includes 5.5 Inch Full HD display, 1.7 GHz octa core 32 bit chipset, 2GB RAM, 16GB internal storage, all reasonable for the price. For photography there is 13MP rear camera with LED flash and and a 5MP front camera. There is 3000 mAh battery inside which should suffice for one day use for moderate and basic users. Once again, hardware is pretty reasonable for the price. Chances of this making out of China are slim at best, but in case it makes it to Indian shores, we will have the best price of Pepsi P1s ready for you on our price comparison page. You can keep tabs on the lowest price of Pepsi P1s in India by setting an alert.